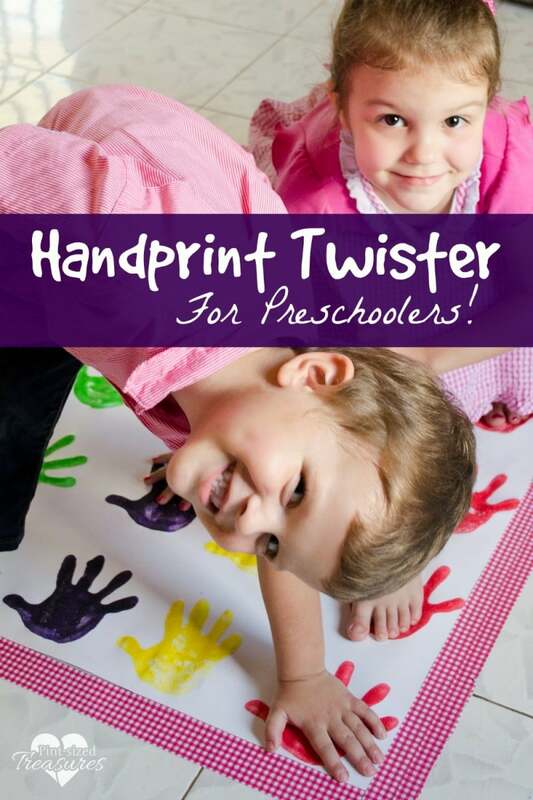 Twister is a fun way to teach your preschooler colors while having fun! 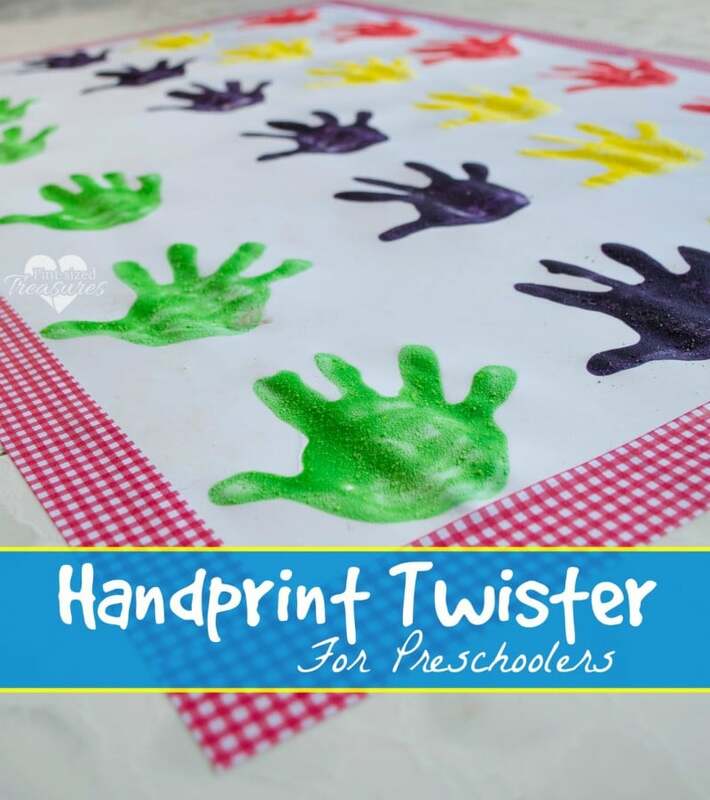 Make it even more fun by making your OWN twister game with handprints! This was a super fun craft and game for my preschooler. She couldn’t wait until we finished snapping pics so the twister game could be all hers. We used homemade finger-paint so we didn’t have to worry about staining her clothes or the floor. All the paint washed out beautifully! We made a small twister board since we only have two preschoolers in the house. 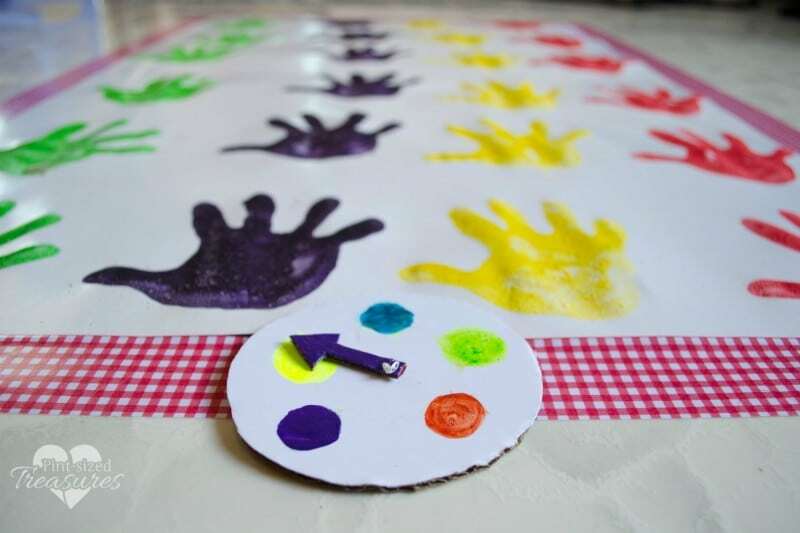 If you want to do this fun craft and game for a party, feel free to add more rows of handprints — just make sure you give your twister board plenty of time to dry! What preschooler doesn’t love to make handprints? My son loves to trace his hand, fingerpaint, make handprints, footprints and anything that involves hands and crafts! If I want to make my little ones smile, all I have to ask is, “Do you want to paint?” Immediately squeals fill the room and they hurry upstairs to put on some safe clothes for painting. 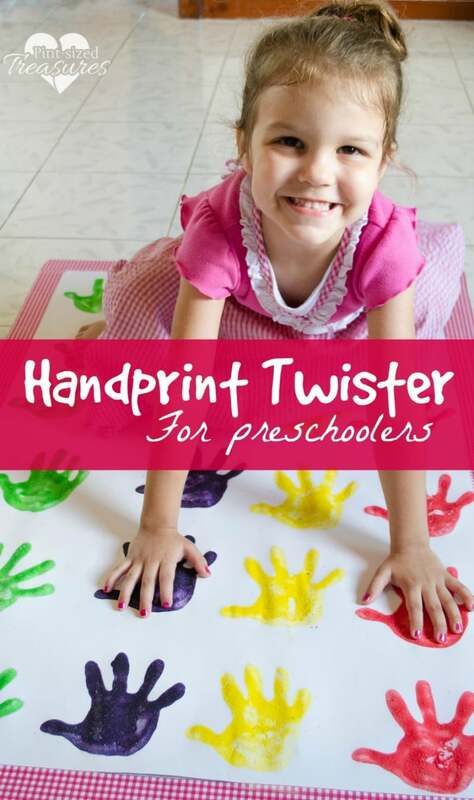 When you’re making your handprints, don’t forget preschoolers can get wiggly. I tried to steady my daughter’s hands, but every once in a while she moved at the wrong time. Oh well, it’s a kid craft, right? Also, I made sure we let her hand drip the paint onto some other paper first before starting our handprint. If you dip and immediately do the handprint, you will probably have lots of colored drops all over your game board! Speaking of paint, one thing I love about making your own twister game is you can choose the colors! Yay! Want stripes, polka dots, neon colors or classics? Just make sure your spinner matches and you are ready to go! We added one extra color for a free spin. So whenever that color is chose, kids get to put their hands or feet on their favorite color! Fun, huh? I chose large poster board for this game so we could easily roll it out for another day of Twister fun. I also taped it down with decorative washi-tape so the board wouldn’t move during the game. I threw out the left hand right hand concept from the original Twister game, so that it would be easier for preschoolers. Feel free to add it back in, if you wish. I just thought we could focus on fun and colors and learn right and left in another game or activity. We also made a simple spinner for the game using dental floss. Yep, floss. It works — really! Directions follow below for your own preschooler version of Twister. Have fun! Ready to have some preschool twister fun? Here’s what you need! Lay out poster board on floor or ground. Place each color of finger-paint in a separate container. We used small bowls. Then have your preschooler dip their hand in the paint, but let it drip back into the container for about five- to ten seconds so you don’t get lots of colored drips on the paper. Remember to use the same hand for each row so you don’t have thumbs all over the place! :) Make 4-6 rows of handprints with six in each row. Let board dry. Cut a small circle out of strong, white cardboard. Then, trace an arrow onto another piece of strong white cardboard. Cut this out to be your spinning hand. Paint or color if desired. Now, make a small hole on the bottom of the spinner with the tip of a writing pen, about 1 cm from the end. Now, thread the needle with dental floss. Make a knot in the end of the floss. Now, using the needle, thread through the spinning hand from the front of the spinner and pull the thread through to connect the spinning hand to the spinner. Once the thread is pulled through to the back of the spinner, cut the thread close to the eye of the needle. Next, make about 10 knots to secure the spinning hand to the spinner. Now, you can us your child’s thumb to make thumbprints for the colors, or you can paint on colored circles with nail polish. Whatever way you prefer to get the colors on the spinner. Feel free to add one extra color for a “free color.” Whenever someone spins that extra color each player can choose whichever color they want! Have fun teaching your preschoolers their colors with this fun game that is also a craft! Yay for learning fun!